During the past decade, I've learned to love travel. The old J.D. was too timid to explore the world. He was afraid of everything — flight delays! terrorists! foreign languages! weird food! — and so stayed home and dreamed of exploring the world instead of actually doing it. Since 2007, however, I've visited forty-two states and twenty different countries (many more than once). I've camped high in the mountains of Bolivia, ridden a scooter through rural Turkey, and eaten fried grubs in Zimbabwe. I've been to Cape Horn off of southern Chile and the Cape of Good Hope off the tip of South Africa. I've strolled through glaciers in Alaska, climbed mountains in Peru, and snorkeled in the Galapagos. I've spent ten years making up for the time I sat on the sidelines doing nothing. And I've only barely scratched the surface of what this amazing planet has to offer. It'd take several lifetimes to see it all. The more I see, the more I wonder what it'd be like to live somewhere else. I know a lot of early retirees do pack up and move around the globe. That's one of the primary premises of Paul Terhorst's Cashing In on the American Dream, the first big book about financial independence. And it's what lots of modern early retirees do, from the Mad Fientist to Go Curry Cracker. But what would it be like for me? And how much would it cost? That last question is a big one. Comparing costs has always been a barrier when evaluating choices like this. Until now. Now a Money Boss reader named Robert — who writes about money and travel at The Frugal Vagabond — has whipped up a handy little web app called The Earth Awaits. I love it! It finally demystifies the finances of living abroad. The Earth Awaits is an online tool designed to help folks like me (and you?) find cities and countries to live in long-term. Based on parameters you feed the app, it provides locations with costs-of-living that meet your requirements. Let's say, for instance, that I have a budget of $4800 per month (which is how much I actually spent in January 2017). I want to find a two-bedroom apartment in the city center where Kim and I can enjoy a modest lifestyle with low crime and only moderate pollution. And I don't want to live in North America. Based on these parameters, The Earth Awaits says there are 176 places I could afford to live. That's a lot! 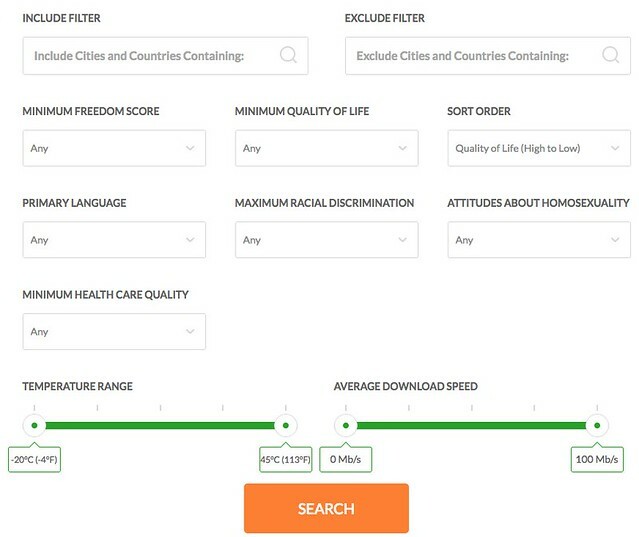 Fortunately, I can further refine resultes, either by changing the initial parameters or by applying advanced filters, such as temperature range, primary language, health care, racial discrimination, quality of life, and “freedom score”. Or I can simply choose to sort the entire list of 176 possible homes by categories like population, budget, and internet . So, if I apply filters based on my liberal Portland sensibilities — high freedom score, accepting of homosexuality, low racial discrimination — and opt for Spanish as the primary language, I can reduce the list from 176 possible cities to only nine — all of them in Spain. In fact, one of the choices is Zaragoza, where I already have a friend (the woman I tutored in English during 2012). The Earth Awaits offers lots of functionality for free — even if you don't register for an account. If you do create a free account, you can subscribe to changes in city budgets, track price changes for individual items, and save cities for later research. And if you sign up for the paid version, you get lots more (such as historical pricing data). The Earth Awaits is a terrific tool. It contains tons of great info, from data on women's rights and legal marijuana, to perceived corruption and potential travel problems. But the tool isn't perfect. A lot of the information is vague and/or opaque. The “traffic index”, for instance, says that it indicates traffic inefficiency versus New York City. But what exactly does that mean? I have no idea. 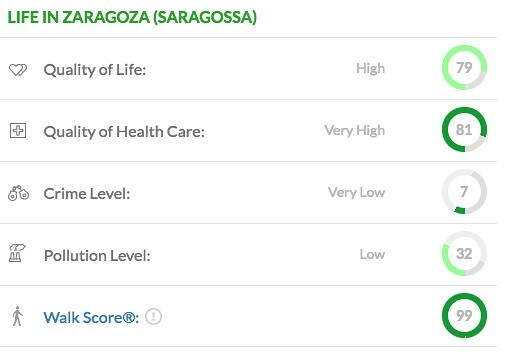 Zaragoza has a traffic index of 43.27. Is that good? Bad? Mediocre? And what the hell is the “freedom score”? Really, though, these are minor quibbles — and they're easy things to fix. If you have any curiosity about living abroad, you need to bookmark this website. Note: The Earth Awaits offers more than just cost-of-living comparisons. It also provides what it calls “the internet's first travel hacking search engine”. That might be a bold claim — AwardHacker has been around a bit, hasn't it? — but it's still a nice feature. Want to figure out how to use your airmiles to get from her to there? This tool can help. There are 9 reader responses to "The Earth Awaits: Comparing Cost of Living Around the World". Thank you for the great article, J.D.! You’re right that I could demystify some of the numerical indices a bit, so I’ll definitely work on that. I’m always trying to make the site work better, so I try to incorporate all feedback as best I can. You’re right about Award Hacker… I actually didn’t know it existed when I started working on the functionality :) That said, I *think* it’s the only tool that does the award travel search *and* figures out the card offers that apply best to the redemption, and I’m working to improve it a lot by adding the ability to stack multiple card bonuses (for folks who are hoping to splurge on Business or First class travel). I had a quick look at the tool. Super post, JD, and what a useful tool. I didn’t see a quick way to simply look for a city you’re already looking into, but maybe I missed it. I am signing up on the site and I’ll look around more. Hey Dorothy! You can browse all the cities by clicking “Browse” at the top of the site. The Earth Awaits is a great and useful tool! I’ve played with it before and like to see where I can retire with my expected monthly retirement budget. I’ll probably use it to find a place once I reach FI and if I decide to not stay in the US. what a timely post! I’ve recently been toying around with the idea of traveling in definitely when my wife and I reach FI. We are still a few years away, but the idea of using geographic arbitrage is very appealing. This tool is great! nice post. This is awesome, thank you! We toy with the idea of retiring overseas (my husband more than me), so this is really useful. Wow this is a gem! Hubby and I have toyed with the idea of relocating to some other cities when we retire. Would love to try this out!